For many years when I was growing up, I always heard the old wives’ tale “Time flies when you are having fun”, and my brothers I can tell you that it is a very true statement. 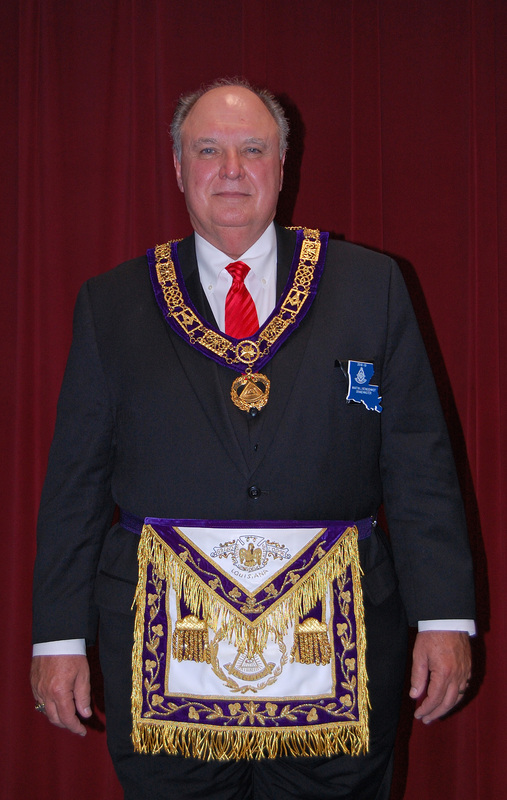 It is hard to believe that I am now in the last quarter of my term as Grand Master of the Grand Lodge of Louisiana. It seems like it was only yesterday when M: W: Brother Mollere installed me, and I began to wonder what exactly I had gotten myself into. Now I know, it is an incredible journey. As we are fast approaching our 208th Grand Lodge Session, which will be held on Friday, June 28th, Saturday, June 29 and Sunday, June 30th at the River Front Center in Alexandria, LA, I want to remind you of some things that you and your lodge need to take care of. First, by now every lodge should have sent its Per Capita tax check into the Grand Lodge Office. Remember those were due way back on Friday, March 15th. If your lodge has not done so, it will take your lodge’s representatives a lot longer to get registered when they attempt to do so. Instead of just standing in one line and getting their credentials and their voting device, they will now need to stand in a line to pay any outstanding fees due from the lodge, and then they will have to go stand in the line to get registered. Also, by having prepaid your lodge’s per capita taxes and fees it makes it easier not only on your lodge representative but on the ladies of the Grand Lodge Office who are there at the registration desk trying to assist everyone with those pesky last-minute changes. And lastly, hopefully, your lodge’s secretary will go into your lodge’s homepage on Grandview and registered your lodge’s voting delegates as soon as pre-registration is open. Again, this will greatly simplify the entire registration process. The deadline for submitting resolutions to be considered at the upcoming Grand Lodge Session is April 29, 2019. The resolutions must be properly formatted, and there is a sample form of how the resolutions should be formatted on The Grand Lodge website, you can view it when you log into the members’ portal and clicking on the Post tab. If you have not registered to access the members’ portal, you can do so by simply clicking on the “Sign Up” tab and following the instructions. Or you can ask your lodge secretary to print out the form for you. But everyone who has access to a computer should have gone in a created their member’s id, so that you can update your own information as it happens, such as address, phone number or email address changes. One last note on the upcoming Grand Lodge session. My Brothers if you re planning to attend and you are one of your lodge’s voting delegates, plan to stay for both days of the session. Too many times we see many brothers leaving the session as soon as the major issues, voting on the resolutions and or the report of the Appeals and Grievances committee, are complete. On Sunday the election of officers and the election of the members of major committees and boards are held. Your vote counts. I am looking forward to visiting more of our lodges in the remaining time that I have, and I am hoping that we can have a peaceful and productive Grand Lodge Session. Many things have happened this year, and 99% of them have been good and productive things. I will do whatever I can in the time remaining to continue to work towards making Masonry in Louisiana fun once again, and I am asking that you help me in this quest. Here’s to seeing you somewhere down the road at a lodge meeting or at our Grand Lodge Session on Saturday, June 29th, and Sunday, June 30th.